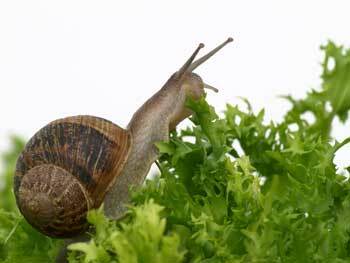 Snails are hermaphrodites, so every snail can lay eggs. However, they need to couple with another snail in order to fertilise each others eggs. The snail eggs are laid in nests, with around 100 eggs to each. They resemble miniature ping-pong balls and are opaque white in colour. They take three weeks to hatch. The baby snails are put into plastic boxes, in an insulated room kept at a constant temperature, where they begin feeding. Four weeks later we start fattening them up, they are graded for size and the stock rate per box is changed. The rejects, namely those that have not grown large enough, are held back for further feeding until they make the grade. The snails are ready for market at 15 weeks when they are around 12 grams in weight. It’s at this point in their lifecycle that they offer the best meat quality and flavour. We stop feeding them, but continue to wash them daily in order to completely clear their systems of waste matter. When ready the snails are blanched in boiling water for three minutes. As they are tucked up in their shells in a state of hibernation, the meat is a nice circular shape without the extended ‘foot’ or antenna. They are then de-shelled and vacuum-packed prior to delivery. Though snails may not be everybody’s cup of tea, some of the most celebrated gastronomes in the UK place snails high on their list of favourites. Heston Blumenthal is perhaps the most celebrated, with his ubiquitous snail porridge, and Gary Rhodes is another gastropod fan the Escargot.